Yelp Introduces New Economic Indicator, The Yelp Economic Average | Yelp Inc.
SAN FRANCISCO--(BUSINESS WIRE)--Jan. 31, 2019-- Yelp Inc. (NYSE: YELP), the company that connects people with great local businesses, today introduced the Yelp Economic Average (YEA), a new benchmark of economic strength. Today's data resources for measuring economic health generally either focus on giant corporations or move at a glacial pace. Yelp has information on millions of U.S. businesses and the interests and needs of our 34 million monthly app users and 75 million monthly mobile web users, which researchers have found makes us well positioned to accurately and quickly measure a huge swath of the economy that is missed by many major indicators. 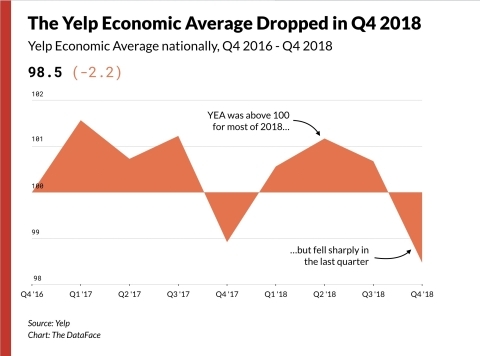 From sandwich makers to sporting-goods sellers, business sectors throughout the economy are slumping, according to Yelp data. Over the past quarter, the YEA fell by more than two points, due in part to declines in the professional services, shopping, and other categories. Slumps in core business sectors may be early signs of an economic downturn. A second successive fourth-quarter slump isn’t a result of seasonality; we’ve normalized the data so that it is seasonally adjusted. The downturn left few business sectors untouched. Everything from high-end retail such as jewelry stores and antique shops to pricey professional services such as private eyes and architects were hit hard in the fourth quarter, in a trend extending to sectors beyond our core 30. So were more routine discretionary offerings, such as burger places, bars and coffee shops. The handful of sectors to buck the trend and rise in the quarter includes self-storage facilities, which can be countercyclical, thriving when people downsize homes or need to upsize homes but can’t. For an interactive look at the specific category and business sector trends included in the YEA, visit our blog, here. Amid all the declines, a few in particular caught our eye. Here’s our best guess about what could be driving the change. With marriage rates remaining well below previous generations’, and the newest newlyweds staying together longer, one line of business that caters to married people is struggling: divorce law. The category was down six-tenths of a point last quarter, though it remains strong in the Midwest, with a 5.4-point increase in the region. Sandwiches and baked goods also are struggling, with fourth-quarter dips exacerbating long-term declines. Low-carb diets remain popular despite mixed scientific findings, while the increased availability of gluten-free foods may be taking consumers away from their traditional sources for bread-based products. As more Americans spend more time on their phones accomplishing a greater number of tasks, that’s hit businesses that sell computers and ones that sell computer-repair and IT services—two of the 30 sectors included in YEA. We’ve made something a little different than well-known economic scores. The Dow Jones Industrial Average, the Standard & Poor’s 500 Index, the Nasdaq Composite Index, and other stock indexes measure the value of companies so big they’re owned publicly. The Gross Domestic Product bundles the local consumer economy with business-to-business commerce and national and multinational firms. YEA, by contrast, is a measure of the Yelp economy, which underpins the local economy. A successor to Yelp’s long-running Local Economic Outlook, YEA is inspired by the major stock indexes. They track the stocks of major companies while YEA tracks the fortunes of businesses in 30 important sectors on Yelp, drawn from the backbones of the Yelp economy: restaurants, retail and service companies. On Yelp, people join the waiting list remotely at places to buy sandwiches, and request quotes from companies that can clean their offices. Both types of businesses are represented in our index. Taking a page from the basket of goods used to calculate inflation for the Consumer Price Index, Yelp’s data scientists have identified a basket of other businesses, chosen for their sectors’ representativeness and consistency, to form a baseline against which the Yelp 30 are being compared. YEA is part of a larger project to surface insights from Yelp’s data to help businesses succeed and provide policymakers with information to boost their economies. Methodology: The Yelp Economic Average (YEA) is a composite measure of the economy, reflecting both business health and consumer interest among businesses in 30 sectors. The 30 business sectors, or categories—we call them the Yelp 30—are drawn from eight umbrella business categories on Yelp: restaurants, food, and nightlife; local services, automotive, professional, and home services; and shopping. The share of YEA components from each of these eight categories is based on each one’s share of the economy, as estimated from County Business Patterns reports. Uniform spread across the four Census Bureau-defined regions of the country. We then chose baseline categories against which to compare the fortunes of the Yelp 30. This step helps remove changes due to seasonality and Yelp’s internal growth; what remains is a reflection of real economic patterns. We selected all other root categories not represented by YEA components as baselines because they provided the most robust controls against seasonality and activity on Yelp. Multiply by 100 to make 100 a typical score. Then the two scores are normalized to have the same standard deviation, so that each contributes equal variation across components. To minimize the effect of outliers, the final score is the mean of two medians, one for each set of scores. We calculated equivalent scores at the regional and metro level to provide a local look at the state of the local economy.